APPROACHES TO MAKING MILITARY-CIVILIAN DOMESTIC VIOLENCE COLLABORATIONS WORK: LESSONS LEARNED FROM TWO CASE STUDIES, Laura J. Hickman, Lois M. Davis and Paul Steinberg, RAND Issue Paper, RAND. Copyright © 2003 RAND. AT A GLANCE ~ milITARy RESOURCE HANDBOOK, Virginia Sexual and Domestic Violence Action Alliance, Richmond, VA: January 2008. THE ATTORNEY'S GUIDE TO DEFENDING VETERANS IN CRIMINAL COURT, Brockton D. Hunter and Ryan C. Else (editors), Veterans Defense Project Project, Minneapolis, MN. CHILD ABUSE- & DOMESTIC VIOLENCE- RELATED FATALITIES REVIEWED IN FY 2010, U.S. Department of Defense, Washington, DC. COLLABORATING FOR SAFETY: COORDINATING THE MILITARY AND CIVILIAN RESPONSE TO DOMESTIC VIOLENCE ~ ELEMENTS AND TOOLS, Jane M. Sadusky, Battered Women’s Justice Project, Minneapolis, MN: January 2010. COMPENSATION FOR ABUSED MILITARY SPOUSES, domesticshelters.org, Phoenix, AZ: April 19, 2017. CONTINUUM OF CARING: COMMUNITY RESOURCE CLUSTERS, Coordinated Community Response Demonstration Project, Fort Campbell Army Installation with Christian County, KY and Montgomery County, TN: 2006; adapted from The Community Audit: A Resource for Battered Women's Advocates, Pennsylvania Coalition Against Domestic Violence, Harrisburg, PA: 1997. DOD DOMESTIC ABUSE PREVENTION & VICTIM INTERVENTION PROGRAMS, David W. Lloyd, Office of the Deputy Secretary of Defense, U.S. Department of Defense, Washington, DC: October 29, 2009. DOD FAMILY ADVOCACY PROGRAM (FAP) OVERVIEW, Kathy Robertson, to Victim Services Subcommittee Response Systems to Adult Sexual Assault Crimes Panel, Office of the Deputy Assistance Secretary of Defense for Military Community and Family Policy, U.S. Department of Defense, Washington, DC: February 13, 2014. Domestic ABUSE INVOLVING DOD MILITARY AND CERTAIN AFFILIATED PERSONNEL (DoDI 6400.06), U.S. Department of Defense, Washington, DC: incorporating change 1, September 20, 2011. DOMESTIC VIOLENCE AND THE MILITARY, Deborah D. Tucker, National Center on Domestic and Sexual Violence, 13th International Family Justice Center Conference, Family Justice Center Alliance, Fort Worth, TX: April 18, 2013. Domestic Violence AnD the MilitarY SERVICES ~ ANALYZING ACTS OF VIOLENCE (webinar materials), Deborah D. Tucker, Family Justice Center Alliance, originally aired November 11, 2010. Domestic Violence AnD the MilitarY SERVICES ~ ANALYZING ACTS OF VIOLENCE, Deborah D. Tucker, National Center on Domestic and Sexual Violence, 10th International Family Justice Center Conference, Family Justice Center Alliance, San Antonio, TX: April 29, 2010. Domestic Violence in the Military (chart), Cumberland County Department of Social Services, Fayetteville, NC. Domestic Violence in the Military, National Coalition Against Domestic Violence, Denver, CO. DOMESTIC VIOLENCE IN THE MILITARY BRIEFING, Women's Policy, Inc., Washington, DC: October 29, 2009. DOMESTIC VIOLENCE IN THE MILITARY: IMPLEMENTING COLLABORATIVE MOUS, RAND Research Brief, RAND. Copyright © 2003 RAND. DOMESTIC VIOLENCE PREVENTION MONTH CAMPAIGNS IN THE ARMY, Family Advocacy Program, U.S. Army. DOMESTIC VIOLENCE PROGRAMS NEAR MILITARY INSTALLATIONS, Battered Women's Justice Project, Minneapolis, MN. THE FaCTS ON THE MILITARY AND VIOLENCE AGAINST WOMEN, Futures Without Violence, San Francisco, CA: 2013. Family Advocacy Program Commander’s Guide (edition 3), U.S. Army, 2004. The Family Advocacy Program: Summary of Change (Army Regulation 608-18), U.S. Department of the Army, Washington, DC. Formalizing Collaboration: Establishing Domestic Violence Memorandums of Understanding Between Military Installations and Civilian Communities, Laura J. Hickman and Lois M. Davis, RAND Issue Paper, RAND. Copyright © 2003 RAND. IMPORTANT DIFFERENCES BETWEEN CIVILIAN AND MILITARY PROTECTION ORDERS, E-Newsletter (5th edition), National Center on Protection Orders and Full Faith & Credit, Arlington, VA: April 11, 2013. THE INTERSECTION OF Domestic Violence AND THE Military (special collection), National Online Resource Center on Violence Against Women, Harrisburg, PA: updated July 2013. 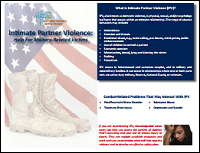 INTIMATE PARTNER VIOLENCE: HELP FOR MILITARY-RELATED VICTIMS (card), Battered Women's Justice Project, Minneapolis, MN: September 2015. INTIMATE PARTNER VIOLENCE: HELP FOR MILITARY-RELATED VICTIMS, Battered Women's Justice Project, Minneapolis, MN. 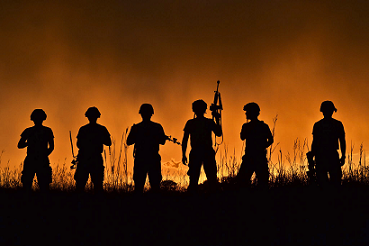 A JUDGE'S GUIDE TO THE SERVICEMEMBERS CIVIL RELIEF ACT, Mark E. Sullivan. MAZE MAP, Battered Women’s Justice Project and Praxis International, May 2005. Memorandum of Understanding for the Management of Reported Alleged Sexual Assault Cases (sample). MENTAL HEALTH QUESTION, STANDARD FORM (SF) 86, QUESTIONNAIRE FOR NATIONAL SECURITY POSITIONS, (policy implementation), Robert M. Gates, U.S. Department of Defense, Washington, DC: April 18, 2008.
the MilitarY COMMANDER AND THE LAW, Air Force Judge Advocate General's School, Maxwell AFB, AL: 2009 electronic update of 2008 edition. THE MILITARY CULTURE AND DOMESTIC VIOLENCE TELECONFERENCE SERIES, Legal Assistance Providers’ Technical Assistance Outreach Project, Pennsylvania Coalition Against Domestic Violence, Harrisburg, PA.
MILITARY POWER AND CONTROL WHEEL, adapted from the Power and Control Wheel developed by Domestic Abuse Intervention Program, Duluth, MN. MILITARY & VETERANS ADVOCACY PROGRAM, Battered Women's Justice Project, Minneapolis, MN. PREVENTING VIOLENCE IN THE HOMES OF MILITARY FAMILIES, Issue Brief, Blue Shield of California Foundation, San Francisco, CA: April 2011. PROTECTION ORDERS: TOOLS IN THE CLIENT-SAFETY TOOLKIT (webinar), Robert Reed and Sarah Henry, National Center on Protection Orders and Full Faith & Credit, Arlington, VA: originally aired February 13, 2013. REPORT TO CONGRESS ON IMPACT OF DOMESTC VIOLENCE ON MILITARY FAMILIES, U.S. Department of Defense, Washington, DC: October 2011. REPRESENTING VICTIMS OF INTIMATE PARTNER VIOLENCE CONNECTED WITH THE MILITARY ~ A HANDBOOK FOR CIVIL ATTORNEYS, Ellen C. Schell, Battered Women's Justice Project, Minneapolis, MN: June 2014. RESOURCE GUIDE FOR MILITARY AND VETERAN DOMESTIC VIOLENCE PROGRAM STAFF, Alliance of Military & Veteran Family Behavioral Health Providers, Greenville, NC: updated October 2011. RESPONDING TO DOMESTIC VIOLENCE AND ABUSE IN THE U.S. ARMED FORCES, Battered Women's Justice Project, Minneapolis, MN: March 2017. SAFETY AT HOME: INTIMATE PARTNER VIOLENCE, MILITARY PERSONNEL AND VETERANS (e-learning course), Battered Women's Justice Center, Minneapolis, MN: 2012. SAFETY ON THE HOMEFRONT: ADEQUATELY ADDRESSING Violence IN FAMILIES IMPACTED BY MILITARY SERVICE, Glenna Tinney and Kathleen M. West, USC School of Social Work, Center for Innovation and Research on Veterans & Military Families, Los Angeles, CA: May 2011. THE SERVICEMEMBERS CIVIL RELIEF ACT: PROTECTING VICTIMS OF DOMESTIC VIOLENCE IN PROTECTION ORDER CASES INVOLVING THE MILITARY, Christine Zellar Church, The Thomas M. Cooley Journal of Practical and Clinical Law (volume 12, pages 335-379), Thomas M. Cooley Law School, Ann Arbor, MI: 2010. Copyright © 2010 Thomas M. Cooley Journal of Practical and Clinical Law. Suggestions for Improving Military-Civilian Domestic Violence Collaborations, RAND Research Brief, RAND. Copyright © 2003 RAND. SUPPORT THE TROOPS AND THEIR FAMILIES ~ RESPONDING TO DOMESTIC AND SEXUAL VIOLENCE IN THE MILITARY, National Center on Domestic and Sexual Violence, Austin, TX and Battered Women’s Justice Project, Minneapolis, MN: November 2004. SUPPORTING STALKING VICTIMS IN THE MILITARY ~ ADVICE FOR ADVOCATES, Stalking Resource Center, Washington, DC. Copyright © 2005 The National Center for Victims of Crime. Thunderbolt Six Policy Memo No. 40-16 ~ BAR LETTERS, Terry L. Tucker, U.S. Department of the Army, Fort Knox, KY: July 18, 2003. UNDERSTANDING THE MILITARY RESPONSE TO DOMESTIC VIOLENCE ~ TOOLS FOR CIVILIAN ADVOCATES, Judith E. Beals, updated by Patricia Erwin, Battered Women's Justice Project, Minneapolis, MN: June 2003; updated January 2007. Copyright © 2007 Battered Women's Justice Project. UNIFORM CODE OF MILITARY JUSTICE ARTICLES RELATING TO DOMESTIC VIOLENCE, compiled by National Center on Domestic and Sexual Violence, Austin, TX: May 2005. VICTIM ADVOCATE GUIDE ~ INTIMATE PARTNER VIOLENCE AND COMBAT EXPERIENCE, Avon Foundation for Women and Battered Women's Justice Project, April 2011. VICTIM ADVOCATE GUIDE ~ INTIMATE PARTNER VIOLENCE WITH MILITARY-RELATED VICTIMS, Battered Women's Justice Project, Minneapolis, MN: January 7, 2011. WEBSITES RELATED TO MILITARY FAMILY LAW ISSUES, originally compiled by Christine Zeller Church, 2005; updated June 3, 2011. WHAT YOU CAN AND CANNOT DO: DOMESTIC VIOLENCE PREVENTION AND INTERVENTION, Deborah D. Tucker, National Guard, Atlanta, GA: April 25, 2012. WHEN JOHNNY AND JANE COME MARCHING HOME..., Debby Tucker, Florida Chapter Association of Family and Conciliation Courts and Office of the State Courts Administrator, Orlando, FL: March 15, 2013. WHEN JOHNNY AND JANE COME MARCHING HOME..., Debby Tucker, Missouri Coalition Against Domestic & Sexual Violence, Columbia, MO: November 8, 2012.